A brief gameplay video for Monster Energy Supercross – The Official Videogame 2 was recently uploaded and you can watch this gameplay clip below. This upcoming moto-racing game is being developed by Milestone S.r.l, the studio that developed the previous Monster Energy Supercross game (which came out earlier this year) and made several entries in the MotoGP game series. The Supercross sequel will have a career mode, better controls, some more training levels, and a track editor for players to mess around with. If you’d like to know more about this moto-racing game then you should read a preview we published back in October. What do you think of this news? Let us know your thoughts in the comments section below. 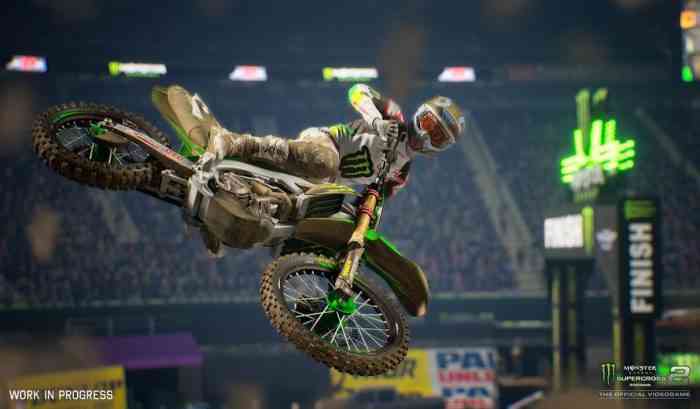 Monster Energy Supercross – The Official Videogame 2 is coming out on February 8, 2019 for the PC, PS4, Xbox One and Nintendo Switch.